Safe bike lanes and pedestrian crossings should be top priorities in the redesign of Second Street. That was the major sentiment at a community meeting on Wednesday, where city staffers rebooting the faltered Second Street Improvement Project asked attendees how they would re-envision the corridor. The residents who attended worked in small groups. Of the 12 group presentations that came out of the workshop, most called for some form of physically separated bike lanes — be they parking-protected, bi-directional, or striped curbside. There appeared to be little appetite for conventional bike lanes placed in the door-zone as originally called for in the SF Bike Plan. Most of the visions also included reduced traffic lanes, amenities like parklets and bike corrals, and transit-only lanes (or at least lanes wide enough to fit buses). One group called for banning private autos altogether on Second between Market and Harrison Streets. Although it’s unclear how strongly the community proposals would be reflected in the final plan, the emphasis on safe bike lanes from attendees young and old was a promising sign, given that neighborhood resistance to the removal of car parking or traffic lanes was one of the major factors behind the project’s stall-out over the last few years. The meeting drew a packed crowd of roughly 100 people, including SFMTA Director Ed Reiskin, SF Department of Works (DPW) Director Mohammed Nuru, and D6 Supervisor Jane Kim, who noted the “amazing turnout” from community members. The SF Bike Plan, approved in 2009, had called for conventional bike lanes on Second, but approval was postponed to allow SFMTA and DPW staff to revise the plan. However, after a series of bureaucratic tangles and miscommunications between the agencies, dedicated funds for the project expired in February. Agency staff are now looking to re-fund it through sources like the Prop B street improvements bond, Proposition AA (a local vehicle license fee), and the federal One Bay Area Grant. Cristina Olea, project manager for the DPW, said the project cost could range between $6 million and $10 million, largely depending on how much concrete work is needed for improvements like curb extensions. Although staff said major sidewalk widenings aren’t on the table due to their relatively high cost, corner bulb-outs could be included to help improve dangerous pedestrian crossings. In particular, many attendees pointed to the intersections at Harrison and Bryant Streets near Highway 80, which both have double turning lanes. 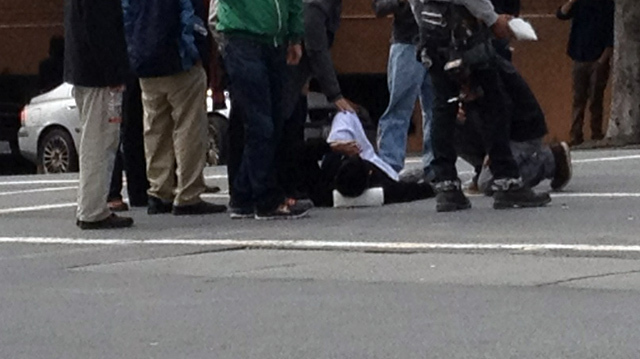 In March, a 35-year-old man was injured in a crosswalk at Second and Bryant by a driver who fled the scene — one of hundreds of citywide pedestrian injuries every year that cost San Francisco about $76 million annually. A woman was also killed at Second and Townsend Streets a year before that. In the last five years, there were 31 pedestrian crashes, 11 bicycle crashes, and 64 vehicle crashes on Second Street, according to a DPW presentation [PDF]. Over a quarter of those took place at the Harrison and Bryant intersections (17 and 12, respectively). Attendees seemed to voice mixed feelings on removing car parking and banning left turns, both of which could free up room to accommodate bike lanes and speed the 10-Townsend and 12-Folsom Muni lines (the 12 is planned to be replaced by the new 11 Downtown Connector route under the Muni Transit Effectiveness Project [PDF]). A couple of groups recommended including a center turning lane like the one on Valencia Street. Staff plans to hold two more community meetings in August and October and aim to have the plan approved by the SFMTA Board of Directors in a year. Construction on the project would take a year and could start by 2014. Be sure to check out the neighborhood advocate blog Great Second Street. It was a good meeting (and incidentally I was in the group wanting to ban cars on part of 2nd). It will be interesting to see how DPW translates the feedback into an actionable plan. It wouldn’t be possible to completely ban cars on that stretch of 2nd without other substantial redesign of the side streets. There are a number of buildings with primarly or sole vehicle access to/from 2nd. @google-6aa6a97fa7a641e40fd411ee6013ac23:disqus I agree. Keep in mind the designs were very lo-fi (paper cutouts to represent bike lane, parking, parklet, etc.. on a street outline) and I assume are nothing more than broad strokes to give DPW a starting point. I think just getting the idea in was a positive even if it is currently unrealistic. The meeting was much less contentious than I expected and every group seemed to have the same things in mind — bike lanes, better pedestrian access, more greenery, etc. It was a good, fresh start. The main objection by the neighborhood a few years ago was the banning of left turns because of the negative externalities that would cause on surrounding streets. Also, the SFMTA was still deaf to pedestrian safety needs when the bike plan went through, and pedestrian safety advocates like myself were not going to have a plan that makes 2nd Street safer while simultaneously making streets to the NE and SW made more dangerous with the ban on left turns. The SFMTA should move the buses off of 2nd Street … The 10 Townsend is mostly used to move commuters who park cars in Potrero Hill for free and who ride in on Caltrain to their FiDi jobs, and serves the SoMa residents and 2nd Street very minimally. Move the 10 Townsend to 3rd and let Rincon Hill get a SoMa connected bus line by running the 12 Folsom further east to Main Street (and return up Beale). The City showed real commitment to making this a genuine community process at this meeting. The turnout was great, both neighbors and the City Family: SFMTA, DPW, and our District 6 elected Jane Kim. Though the design charrette was necessarily simplified, dealing only with the two typical street sections of Second Street, it allowed priorities to come through clearly: pedestrian safety, better cycling, and a strategy to calm the Bay Bridge congestion. Kudo’s to our hard working and smart folks who serve our City: most of them really get it. To come will be the difficult task of translating this community feedback into a comprehensive design that has many challenges in dividing road capacity fairly between all the users. We have a blog advocating a pedestrian, bicycle, and transit perspective (with necessary truck and auto traffic) at http://www.GreatSecondStreet.org. Check it out and please give us your ideas! I think moving the buses off Second is a long shot at best. You can suggest it, as folks are suggesting banning cars from Second from Market to Harrison, but I’m quite willing to make book on neither happening in the time frame of this project. Up there with getting struck by a falling space craft. Why do you said that? From what I can see the bus is packed with normal bus riding folks. The few folks in my office who drive to work have no problem finding a lot in SOMA for $10-$15. I don’t think anyone will bother with 10, which run once every 20 minutes. The 10 moves pretty fast, for $75 a month instead of $15 per day. The closer reaches of Potrero Hill are pretty close to downtown but have a lot of empty parking. Even if you can find parking near the Embarcadero for $15 per day, the congestion level getting into there doesn’t make the 10 some horrible option timewise – exit Mariposa and swoop in on easy parking. The 280 exits at 4th and 6th back up. If you really doubt this – just ask yourself – why are West Portal, Forest Hill, 30th/Church, Glen Park, even Lake Street in the Avenues permit parking? Because people *do* drive into areas that they can use as a park and ride. The 10 runs on a “schedule” and even if traffic defeats your effort to meet the bus, there is a Starbucks and a Whole Foods. Not to mention being able to do your grocery shopping at the WF right after getting off the 10 and heading straight home. What’s scary is that they are doing this to take the 10, instead of the T. What does that say? Sorry I know as a matter of fact that this is not true. Most passengers get off at 4th and King. The bus cannot be used mostly for people who park their can in Potrero Hill. Read what I wrote again, keeping in mind 4th & King is the Caltrain station stop for the 10 Townsend. Before moving to Rincon Hill, I rode this bus to work from Potrero Hill. I speak from nearly 2 years riding that bus, and I can tell you it is a commuter bus …. 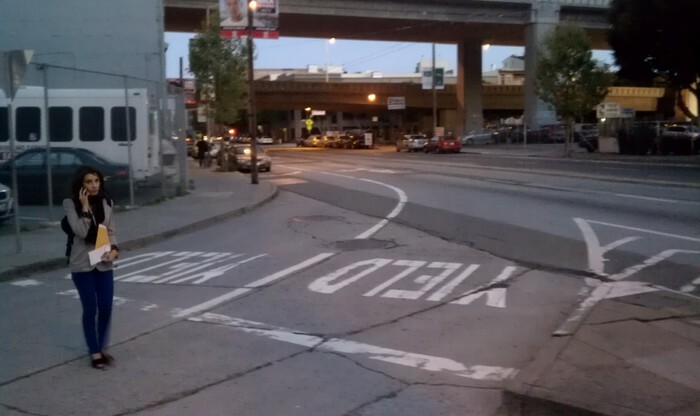 From 16th and DeHaro, folks who park for free in Potrero Hill make up the majority of riders getting on …. I’ll give you that some of the drivers I saw getting on the 10 may have driven down 4-5 blocks from up higher on Potrero Hill, but most drivers came from outside of neighborhood in their cars. The next decent number of folks boarding come from Caltrain. At the end of the day, the big exit is Caltrain and then the end of the line in Potrero Hill. My main point is the 10 Towsend does not serve much purpose to SoMa residents. Also, the 12-Folsom could run further east instead of briefly turning onto 2nd and ignoring Rincon Hill. Well I missed the part about ‘and’ caltrain rider. I’m still not convinced that there are significant number of car commuter on 10. But let’s say half of the riders from Potrero hill are in this group, keep in mind that only about 1/4 of riders make it as far as Potrero Hill, then they will still make up small minority on bus. Just to clarity so that another person will not misread it like me. Going back to the idea of moving bus off 2nd. What does it try to accomplish? If you move 10 to 3rd St, it will mostly duplicate the 30 and 45, which is already running at much higher frequency. It does not seem to help anyone. The bigger problem is the south bound bus have to run on 4th St then. This will leave a huge gap between Embarcadero and 4th St without north-south transit (12 turns into Folsom). 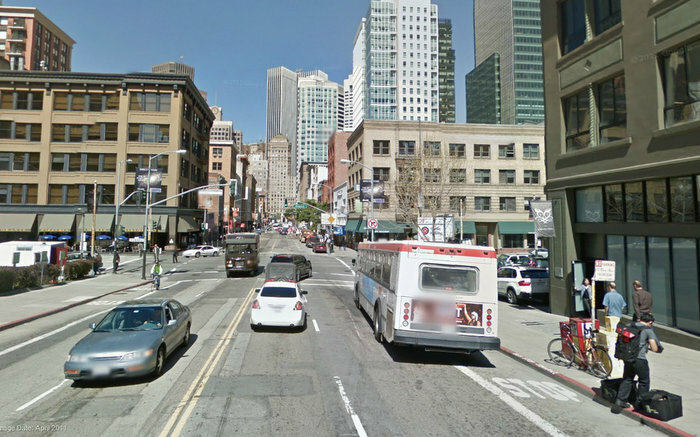 Even I’m advocate of wider stop spacing, a space between Embarcadero and 4th is too big of a gap. Removing the two MuNi lines from 2nd Street frees up 3′ to make better uses of the available width of the street for pedestrians, bikes, and private cars/taxis. SoMa residents need SW to NE bus lines from the water to Division … The 10 doesnt really serve SoMa, just commuters who drove in to Potrero and parked or rode in on Caltrain. The 10 Townsend would be fine riding up/down Market from 3rd or to 4th to the north of Market quirky turn onto, what is it, Sansome these days? we have high density business and increasingly residential district there. It makes perfect sense to have local transit that connect them. I’m bewilder by your suggestion to essentially eliminate a bus line from the train station. I’m just going to repeat this. It makes perfect sense to have a bus line running on 2nd St. This give us 3 nicely spaced north-south transit across the densely developed area. Even BART has 3 stations along the same distance. In California Cities, Drivers Want More Bike Lanes. Here’s Why. Is a pedestrian promenade possible for Valencia?